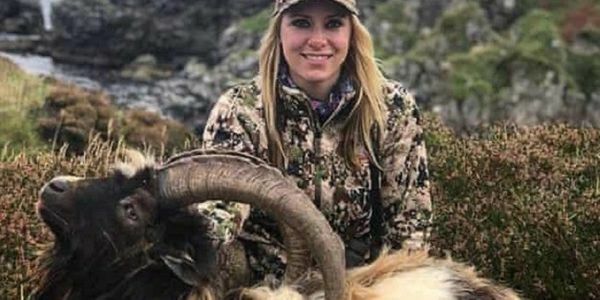 Disturbing photos posted on social media by self-proclaimed "professional huntress" Larysa Switlyk during her trip to the island of Islay in Scotland have sparked outrage around the globe, and within the Scottish government as well. In the photos, Switlyk, who lives in Florida and hosts a hunting TV show, smiles beside the carcasses of goats, stag and sheep she killed with a high-powered rifle. "Such a fun hunt!" she wrote regarding the killing of a wild goat. "They live on the edge of the cliffs of the island and know how to hide well. We hunted hard for a big one for 2 days and finally got on this group. Made a perfect 200 yard shot and dropped him…"
It's currently legal in Scotland to hunt deer and goats as a part of sustainable land management. But because of Switlyk and her disgusting photos, those laws could, and should, be changing. Michael Russell, the local Member of the Scottish Parliament (MSP), called the photos "horrific." He said it was unacceptable "to see people in camouflage with highly powered sniper rifles rejoicing at the killing of a goat, let alone a ram." Russell wants goat hunting on Islay stopped immediately and is bringing it up with Environment Secretary Roseanna Cunningham. First Minister Nicola Sturgeon tweeted that the government will "review the current situation and consider whether changes to the law are required." Scotland must change its laws to prevent more animals from being killed by trophy hunters. Please sign and share this petition urging government officials to take this action immediately.